The whimsical, macabre tales of British writer H. H. Munro—better known as Saki—skewer the banality and hypocrisy of polite English society between the end of the Victorian era and the beginning of World War I. Saki’s heroes are enfants terribles who marshal their considerable wit and imagination against the cruelty and fatuousness of a decorous and doomed world. 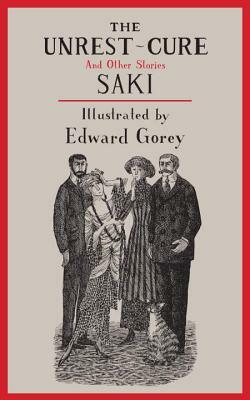 Here, Saki’s brilliantly polished dark gems are paired with illustrations by the peerless Edward Gorey, available for the first time in an English-language edition. The fragile elegance and creeping menace of Gorey’s pen-and-ink drawings perfectly complements Saki’s population of delicate ladies, mischief-making charges, spectral guests, sardonic house pets, flustered authority figures, and delightfully preposterous imposters. SAKI (Hector Hugh Munro; 1870–1916) was born to a military police officer father in British-controlled Burma. After the death of his mother in 1872, Munro and his two older siblings were sent to live in Devon, England, with their paternal grandmother and aunts. Munro was considered sickly and received casual tutoring at home until the age of ten, though he was later sent to boarding school. In 1887 his father retired to England and began several years of travel on the Continent with his children. In 1893 Munro joined the Indian Imperial police in Burma (where he reportedly kept a tiger cub as a pet) but contracted malaria after a year and returned to Devon. By 1894 he had resolved to become a writer and, subsidized by his father, moved to London, where he would receive public recognition for a series of political satires based on Alice in Wonderland. From 1902 to 1909 he worked as a foreign correspondent in the Balkans, Russia, and Paris while publishing short stories and sketches in newspapers; these pieces were gathered in the collections Reginald (1904), Reginald in Russia (1910), The Chronicles of Clovis (1911), Beasts and Super-Beasts (1914), and the posthumous The Toys of Peace (1923). In addition to short stories, Munro also wrote a full-length play, The Watched Pot, in collaboration with Charles Maude; two one-act plays; a historical study, The Rise of the Russian Empire; a short novel, The Unbearable Bassington; and a fantasy about England under German occupation, When William Came. Having enlisted for service in World War I despite being officially over-age, Munro was killed in action near Beaumont-Hamel, France. Edward Gorey (1925–2000) was born in Chicago. He studied briefly at the Art Institute of Chicago, spent three years in the army testing poison gas, and attended Harvard College, where he majored in French literature and roomed with the poet Frank O’Hara. In 1953 Gorey published The Unstrung Harp, the first of his many extraordinary books, which include The Curious Sofa, The Haunted Tea-Cosy, and The Epiplectic Bicycle. In addition to illustrating his own books, Edward Gorey provided drawings to countless books for both children and adults. Of these, New York Review Books has published The Haunted Looking Glass, a collection of Gothic tales that he selected and illustrated; The War of the Worlds by H. G. Wells; Men and Gods, a retelling of ancient Greek myths by Rex Warner; in collaboration with Rhoda Levine, Three Ladies Beside the Sea and He Was There from the Day We Moved In; and The Unrest-Cure and Other Stories, a collection of tales by Saki.